Naughty Dog wants to "marry good storytelling with good gameplay" in The Last of Us. When most developers want to include a strong narrative in a new game, they rely on non-interactive cutscenes. And while cutscenes feature prominently in Naughty Dog's recent Uncharted games, the same may not be true for its upcoming post-apocalyptic survival game, The Last of Us. Speaking to Gamesindustry, Game Director Bruce Straley emphasized capitalizing on videogames' interactivity to tell a story instead, saying that the studio is aiming to "find out how to best marry good storytelling with good gameplay." Straley didn't specifically condemn cutscenes, but he did discuss a couple features that the studio is hoping will keep the player immersed in the game world. One such feature is a "living" inventory system - in other words, the game doesn't politely pause and wait for the player to craft items and arrange equipment. The inventory system itself will also force players to carefully consider their tactics; Straley gave the example of choosing between crafting a molotov or a health kit, saying that the player is "using the same inventory items for both." 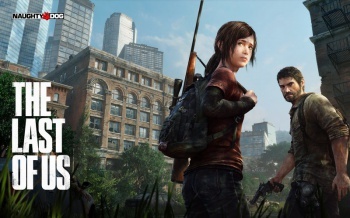 The AI, which Naughty Dog previously touted as being a focus of the game, will also prompt players to strategize carefully. Straley elaborated that NPCs who were banded together would quickly notice a missing member of the group, even if the player kills them stealthily. This keeps players on the move and gives them real consequences to deal with, regardless of stealth. He made sure to emphasize that even in the players' fatal struggles with bandits, the studio hopes to draw the player in with realism. "There's a brutality, there's a violence, but it's not gratuitous." The bandits, which were the only non-player group shown in the E3 demo, will not be the only group in the game. "We're going to see the best and worst of humanity," Straley explained, "you might meet other people in this world who have created a unity or a bond and they're using more of an agricultural sense of surviving and they've gotten a hydroelectric plant back online and they're building families again." The player's companion, Ellie, supports the existence of these peaceful colonies - she is herself born after "the epidemic." As for the game's story, Straley emphasized the main characters and their survival as the driving force of the narrative. He wants to connect players to the game's protagonists, stating, "if we're doing our job right, you as the player feel aligned with the motivations of these characters." The connection between player and character will thus add more weight to players' choices, particularly when it comes to balancing survival and humanity. "If you don't have food in your stomach and you know your neighbor has something in their kitchen," Straley elaborated, "when do you knock on their door and when do you just break it down?"